And now time to point out something you may have seen in the video and reveal how it came to be. I don’t think SEGA will begrudge me expanding on this little detail and how it came to be as no one will remember it except me. A long time back when I was at SEGA the opportunity to put a little Easter Egg in came up which I was asked about. However, I went back and suggested that baring in mind City Escape’s layout you could do a lot more with the billboards and posters. I then suggested a frankly embarrassing array of them to the team, cramming in as many little references as I could possible think of. This was a long time ago though and I never heard anything back from it. But yes, this is probably why you now have Fang/Nack and Bark and Bean referenced in the game on wanted posters. I’m a tad astonished they actually got in, but not just that they actually used my exact wording! Actually getting poor Fang referenced in a game AT LAST has left me pretty chuffed actually! Bean/Bark’s one makes reference to theft/possession of explosives if my memory serves correctly. Charmy Bee’s honey (not sure where butter came from) was one of mine as well and I’m pretty sure you can partly thank me for the expanded Chao In Space 2 movie poster text as well. The magnifying glass one appears to say “Are You Sure You Want To Know” (Chaotix I think… which MAY be a cool reference *ahem*), I think I mentioned doing one for Chili Dogs but it looks like the team came up with one there themselves. These are all the ones we’ve seen so far – but there may be more little easter eggs for you. I’m sure as hell not going to tell you what they are/maybe, you’ll have to find out for yourself. You’ll also note the trailer has refernces to other characters in building names. There’s Amy (Amy’s Market), Blaze (Coffee-Blaze) as well as “Tails’ Pizza” from Sonic Team. I think we can expect lots more fan service in there from them and depending on if anything else of mine got approved – I’ve no idea, so don’t bother asking – you might be (further) surprised. I’m now very excited to see what else Sonic Team have put in Sonic Generations, hats off to them for agreeing to include it! 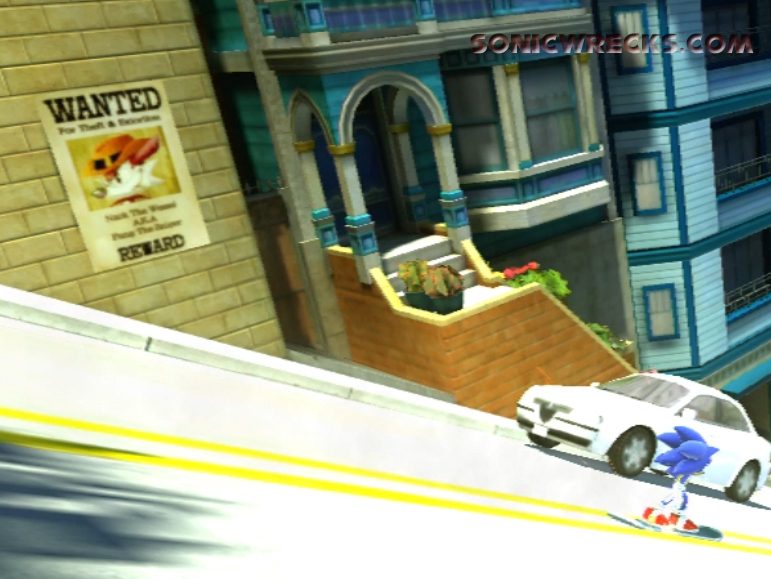 This is ignoring what appears to be Unleashed’s Spagonia/Rooftop Run being teased at the end of course. European fans will get to play Sonic Generations at Summer Of Sonic on June 25th.